in Orlando, Florida. There were a wide range of illustrious speakers: Dr. Harvey, Berniece Mead, Phil Gosselin, Dr. Narendranath Reddy to name a few. The theme of the conference was Love is the Source, Love is the Path, Love is the Goal. We attended study circles focusing on Love and Service. 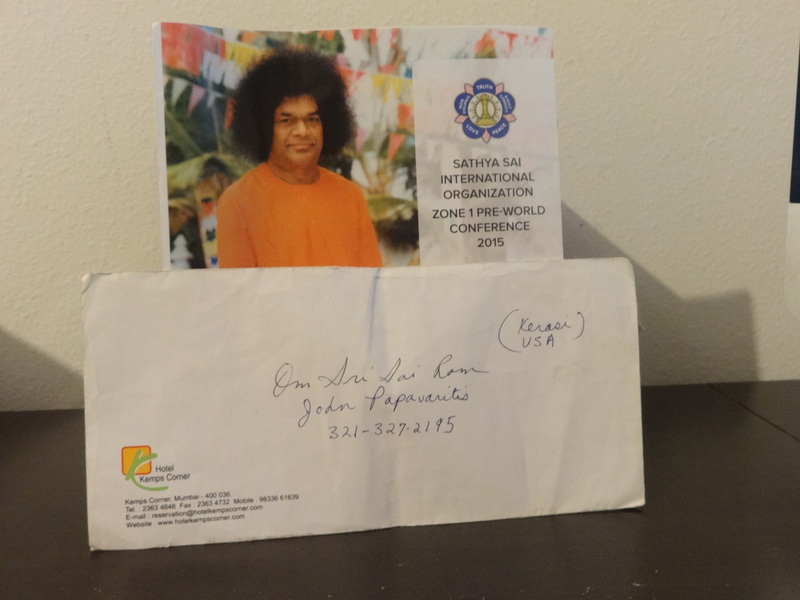 There were also reports on the amazing Sai Baba Zonal service activities being conducted throughout the world. These reports were so inspiring it certainly encouraged all of us to commit to serving more enthusiastically. The Young Adults put on a creative and uplifting cultural program. David and I attended 2 days out of the 3 day program. The energy was high and it was such a blessing to share wonderful satsang with our Sai Brothers and Sisters. I mentioned in an earlier update that at first we were not going to attend the conference, but then Swami came in my meditation and told me, "Where my devotees are gathered there I Am." This motivated us to attend the conference. We traveled up to Orlando with our dear friends Teresa and Andrew. On Saturday, our first day we were both pretty exhausted. Despite this I felt that exquisite flow and Baba's Presence that comes at all Sai gatherings. I didn't experience any visions that day but Sunday was a different story. in Mumbai. In that place many, many astounding miracles and manifestations are constantly happening. 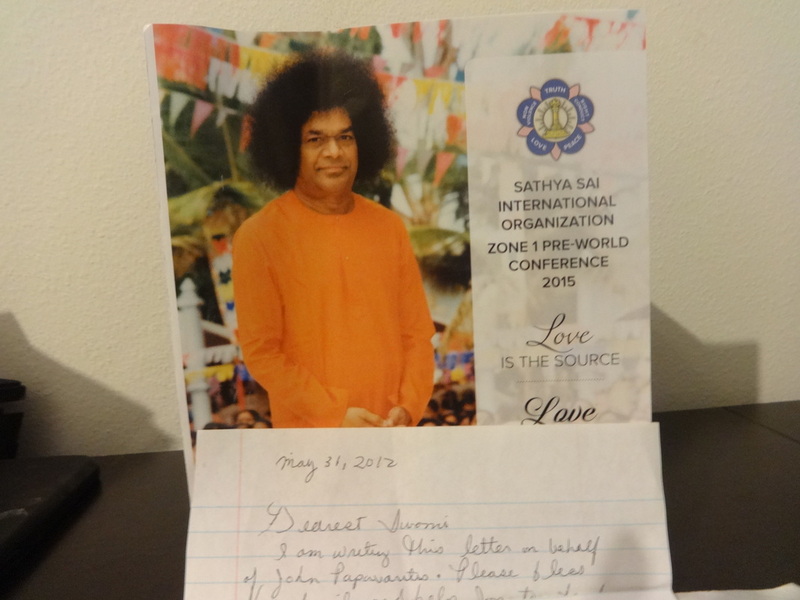 During that visit I wrote a letter to Swami asking him to bless John and his son and daughter with His grace. Also to have mercy on the Miami Sai center which had recently flooded. I sealed the envelope and left it on the miracle altar. 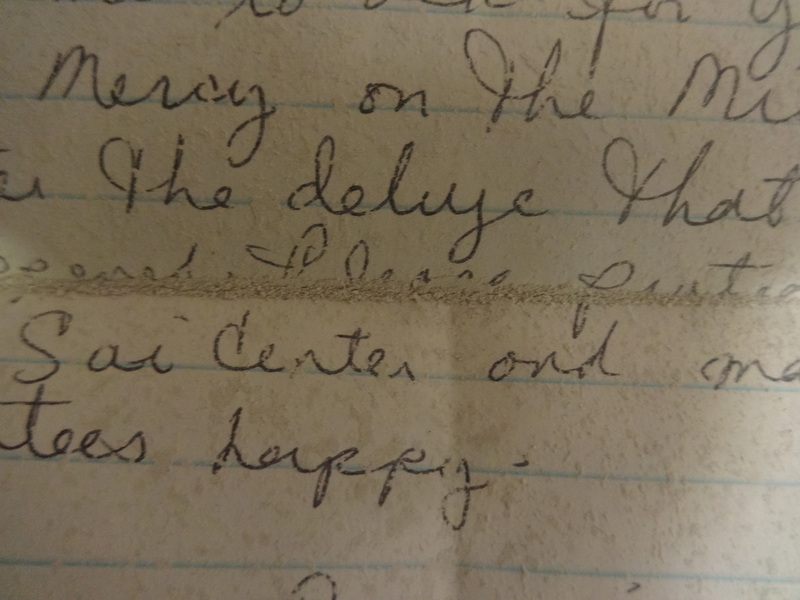 Unknown to me, John had also written a letter and sent it to the Gangawalla residence via another devotee from the Miami center. At dinner John told us that recently he had received both those letters back. He opened the letters; both letters had vibhuti manifested on them. And Swami had indeed fulfilled the requests in these letters. John told us that there was a lady in Miami who was diagnosed with cancer. He decided to give her Swami lingam water, lingam milk and Baba vibuti. Even though she was not a devotee she gratefully accepted and took everything John gave her. When John was writing the letter he was going to ask Baba to heal her but instead re-worded the letter thanking Baba for healing her. After sending the letter, some time later he found out that the woman had a new scan and was cancer free!!!!!!! Our God is an Awesome God!!!!! Praise Baba!!!! You can imagine our delight at this incredible leela. I closed my eyes and tuned into our beloved Baba. I waited patiently in the darkness of my third eye. Suddenly I saw a hand appear on the top part of Swami's Sarva Dharma throne. Then our Lord gracefully sat on His regal chair. He kept fading and reappearing, pouring liquids and busily giving His supernal darshan. The visions stopped for awhile and then bang! - I saw Him robed in white dress - So alluring. Towards the end of the conference I saw our Divine Sai's huge Lotus Feet walking towards us. And during arathi He held an enormous torch spreading light over the entire gathering. At the conclusion of the conference we all returned home fully recharged and happy. David, Andrew, Teresa and I had the opportunity of traveling back home with Professor Swami who served as the principal of Bhagavan's college. Professor Swami shared many stirring stories with us. He related one story. There was a woman who lived in a snowy area of USA. She had to work and left her child home in the basement and went to work. On that particular night a dangerous storm was descending on the area and the woman phoned her child and told the child not to worry she was coming as soon as she could and that she would call back soon. It was taking a long time for the mother to get home and the child was terrified. The phone rang and the child answered the phone. The voice on the other end was none other than our Lord Sai, He told the child not to worry and that He was under His protection. Sai brothers and sisters we are so blessed to be living in the Golden Age of Sai. Let us never take this for granted. Swami is very much with us. His mission of Unity, Love and Peace continues.